When our guests first get on one of our Bombardier 550 Grand Touring snowmobiles, turn the key and fire up the engine, suddenly everybody is smiling. This sets the stage for one of our guided snowmobile tours. Come enjoy our fresh powder fields and a network of groomed trails that we have access to. Narrow and winding with snow covered pine trees, or the open expanse of le Petit Train du Nord, once a railway it is now used as a multifunction linear park. Our guides will take you on a memorable ride through winters frozen playground. All package include: Guide, gas and fuel, helmet and balaclava, snowsuit, boots and mitts. Tours depart throughout the day and we offer evening rides as well. 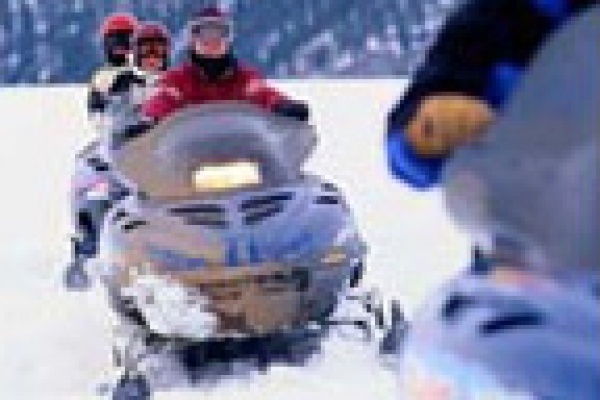 Machines are equipped with heated handle bars and there is room for passangers.